Ole Blue’s motor just doesn’t sound right. We have valve noise, white smoke, and low compression in the #4 cylinder. Before we do much highway driving we need to do some major motor work. While we would have the winter to do the engine work, Barry decided it might be worthwhile to find a newer engine. So he began to search e-Bay and Craig’s List and also called some jeep parts suppliers looking for an engine. 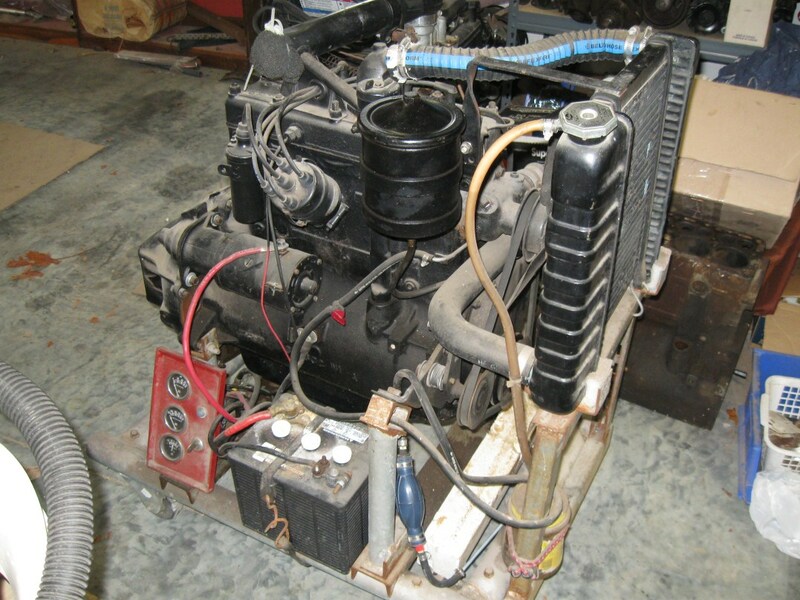 An ad appeared on Craig’s List for a engine from a 46 CJ2a. 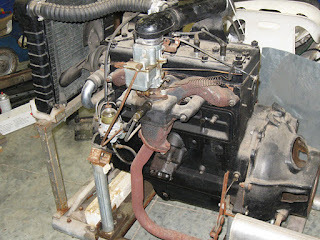 It was mounted on a custom built engine stand so that the motor could be started and run. It had been completely rebuilt and sounded like a good replacement (even if temporary) motor. To make it more interesting, the seller also listed a second disassembled engine too. Readers might remember that we did a JRT (jeep retrieval trip) for both jeeps. 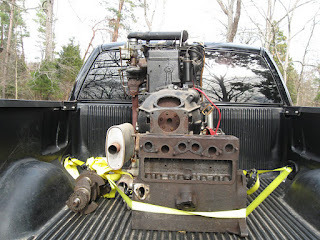 The motors were located about two and a half hours from home, so this called for a JPRT (jeep parts retrieval trip). Unfortunately, Evan couldn’t make the trip, so Barry started out early on the adventure. JRTs and JPRTs are adventures and it is always fun to meet the people and to learn the stories and histories associated with whatever we are trying to buy. The trip to north central Indiana was uneventful and the GPS took Barry right to Randy’s (the seller’s) house. Randy started the engine and the deal was made right then. It was the sweetest sounding little L-134 Barry had ever heard. As Randy said, it is highly unusual to be able to hear a motor that is out of the vehicle before you buy it. While Barry hadn’t really intended to buy yet a third engine, he couldn’t resist what he saw stored in a large metal box. There were lots of parts, many new and the engine appeared to be complete except for the connecting rods. Randy had purchased and rebuilt the one motor for use in a custom garden tractor. 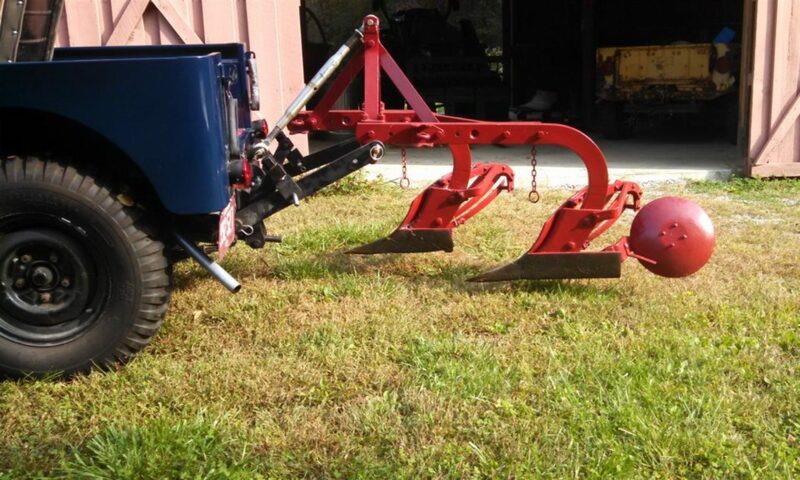 The project was never completed, but he had taken the motor to some antique tractor shows. He loved to just hear the motor run and is looking forward to seeing it returned to a jeep. Randy had a tractor with a loader that made it easy to place the motor and stand in the truck bed. After an hour of talking and loading, Barry headed south. The return trip was also uneventful, except for some totally unexpected rain showers north of Indianapolis. Two and a half hours later the motors were home. With some help from Paula, Barry used his loader forks to get the motors in the garage. The next step is to do some identification of what motors we now have. External signs indicate that the engine on the stand might have a chain for timing (thus an early engine) while the “parts” engine has gears on the crank and cam. But a very successful JPRT! Very informative about installing the SYE kit, nice work. I like the pictures showing the whole process. Makes me feel confident to install on my own Jeep. Nice Blog!